← NFB Goes 3D and HD! Update – January 2011: I’m happy to report that KinoSmith is releasing the film on DVD in March 2011. Order your copy here. Editor’s Note: Doc Soup is a monthly documentary screening programme run by the good folks at Hot Docs. It gives audiences in Toronto, Calgary, Edmonton and Vancouver their regular doc fix each year from the fall through to the spring, leading up to the Hot Docs festival itself. Last Train Home (Director: Lixin Fan): China is arguably the world’s most important economy at the moment and the past fifty years have seen incredible changes, politically, economically and socially. Many filmmakers have emerged from the country, including a number of excellent documentarians. 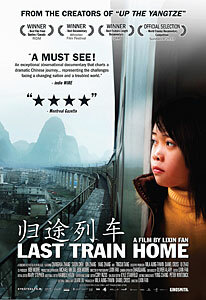 Chinese-Canadian Lixin Fan can proudly stand among them with Last Train Home, just his first feature film as director. In my limited experience, to make a great film about China, you must encompass the country’s vastness, both in terms of geography and of population, but also be able to focus in on individual stories. In this case, we are introduced to the Zhangs, a family of migrant workers, just as the parents are about to make their yearly journey home to their village to celebrate Chinese New Year. Along with 140 million other migrant workers, this is often the only occasion they get to spend time with their children and parents. Making their way from the industrial city in which they work to their village in the countryside is an exhausting and stressful multi-day journey of more than 2,000 kilometres. Traveling by train, bus and ferry boat, they arrive exhausted and are able to spend only a few days with their son Yang (10) and daughter Qin (17), who have grown up under the care of their grandparents. Despite the economic realities which make it necessary for families to be divided this way, the Zhangs feel they are doing it so that their children will have better lives. They constantly badger their children about their grades, perhaps because they really have nothing else to talk about. Daughter Qin is reaching the stage of adolescence where she begins to rebel against her parents. She complains that they’ve essentially abandoned her and her brother and a few months after they’ve returned to the city, she drops out of school to become a migrant worker herself. The boredom of rural life for a teenager looks very different from the perspective of her parents who have been away for 16 years working in horrific conditions just to provide their kids with this protected upbringing, but that’s lost on Qin, who wants the “freedom” of working in a factory. While this is a crushing blow for her parents, who wanted to see her finish her studies, by the next year, they’re ready to travel home again for the New Year holiday. They’ve been pressuring Qin to return to school, and it looks as though she’s reluctantly agreed. But this year’s migration is affected by a snowstorm which knocks out the electrical grid and delays the trains for days. The scenes of huge crowds pushing each other are harrowing. While the trip home is a huge hassle at the best of times, it become a terrifying ordeal when schedules don’t run smoothly. When they finally board their train, it’s clear that Qin is not speaking with her parents, and she spends the whole trip in sullen silence. Things come to a head during the holiday, and Qin’s insolence leads to a physical confrontation with her father. Eventually, like all parents, they resign themselves to letting Qin go her own way, hoping that son Yang can finish school and support the family. In the meantime, they return to the city again, back to their monotonous factory jobs. My synopsis makes this sound like a fiction feature, and for all the intimacy the filmmakers achieve, it might as well be. It’s helped tremendously by some very crisp editing, as well as some sweeping cinematography of the lush Chinese countryside. Last Train Home succeeds in capturing both the epic scale of the changes sweeping today’s China and their impact on the individual families struggling with them. Two additional notes. First the disclaimer: my company (Kinosmith) is the Canadian distributor for this film. And second, the film is headed to the Sundance Film Festival, where it will compete in the World Cinema Documentary Competition. This entry was posted in Doc Soup, Documentaries, Film Festivals and tagged china, family, globalization. Bookmark the permalink.